It's a very fine, vibrantly green, Japanese powdered tea made by steaming, drying and milling hand-picked green tea leaves. Known as the "tea ceremony" tea, matcha has been revered in Japan for hundreds of years. It's the new "green" choice in cafe circles, due to its unique health properties and delicately grassy, citrussy, subtly sweet taste. You'll find it in smoothies, protein shakes, chai lattes, ice-creams and custards; in raw green chocolate truffles and cakes – and even as originally intended, as a refreshing, hand-whisked drink. In Sydney's Haymarket, Boon Cafe's inaugural matcha menu (hot, iced, latte and frappe) has been an instant hit, with the simple, traditional hand-whisked matcha, surprisingly, being the most in demand. "We put it on for its antioxidants and other health benefits" says Palisa Anderson, "although some customers want it served with whipped cream on top!" Nic Davidson and Sarah Holloway fell in love with matcha while in Los Angeles and Japan respectively. After trying 600 different teas, they set up online retailer Matcha Maiden to deliver a certified organic, high-grade, stoneground matcha that was milder and more palatable than the sometimes bitter, concentrated powder. "Matcha has the highest antioxidants on the planet," says Nic Davidson. "I love seeing how different people are using it, in avocado smoothies, cupcakes and yoghurt." Matcha's other-wordly flavour (and colour) makes it a natural dessert player. At The Town Mouse in Carlton, chef Dave Verheul makes a matcha-green white chocolate crumb for his lime posset with green apple and dill. "The matcha is earthy and floral, and really grounds the acidity of the lime," he says. "It is one of the most haunting flavours there is." It's extremely high in antioxidants, vitamins and minerals and seen as a healthy (but still caffeinated) alternative to coffee. Yes, just don't confuse it with sencha, bancha or other Japanese teas in leaf form. 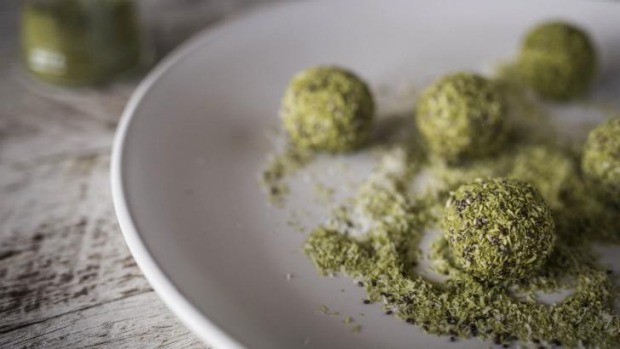 Nuts, seeds and coconut blended with matcha, fresh avocado, coconut oil and mint make a beautifully light, chewy bliss ball in a pretty shade of green. 1. Combine the cashews, almonds and sunflower seeds in a blender or food processor and whiz until fine. Add the coconut, avocado, dried apricots, coconut oil, rice malt syrup, matcha and fresh mint and whiz until smooth and the mixture starts to form into a ball. 2. Lightly wet your palms and roll into small balls, around 20 to 22 grams each. 3. To make the coating, mix the coconut, chia seeds and matcha. Roll each ball in the mixture until coated, and refrigerate for three or four hours until firm. Store in an airtight container in the fridge for up to one week, or longer in the freezer.